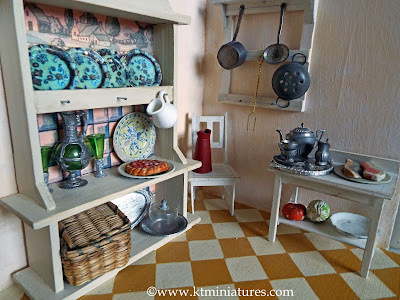 As promised in the last posting on this Journal, here is my little kitchen (the prototype for the impending KT Miniatures workshop) now filled with a few rather lovely old treasures that I have been putting aside specifically to display in it. I am chuffed to bits with the results, as the aged ambiance of the room box and furniture make an ideal backdrop for the genuine antique pieces that I have been collecting over a period of time. 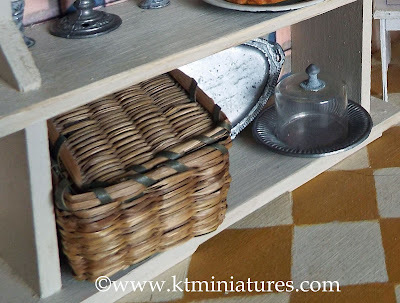 The dresser, side table, chair and wall rack are all part of the workshop project. 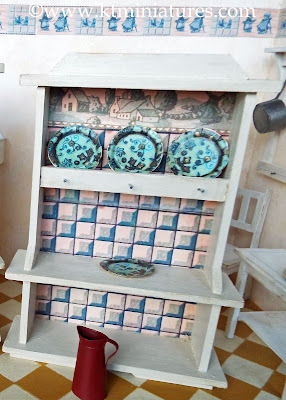 So too the saucepan hanging on the rack, the jug on the chair and the lithographed plates on the dresser - all made from card and based on real antique pieces. 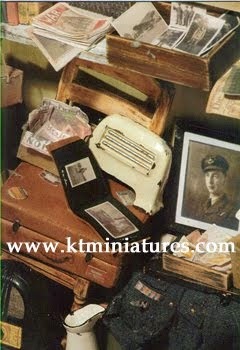 Everything else you see in this photo above is antique or vintage. Next to the saucepan on the wall rack is an old tin colander, a c1930s T&B frying pan and an odd vintage prong. On the side table is a very pretty early 1900s German soft metal tray (fully glazed with real glass) which has a few random pieces of a c1920s/30s German metal art-deco tea set. 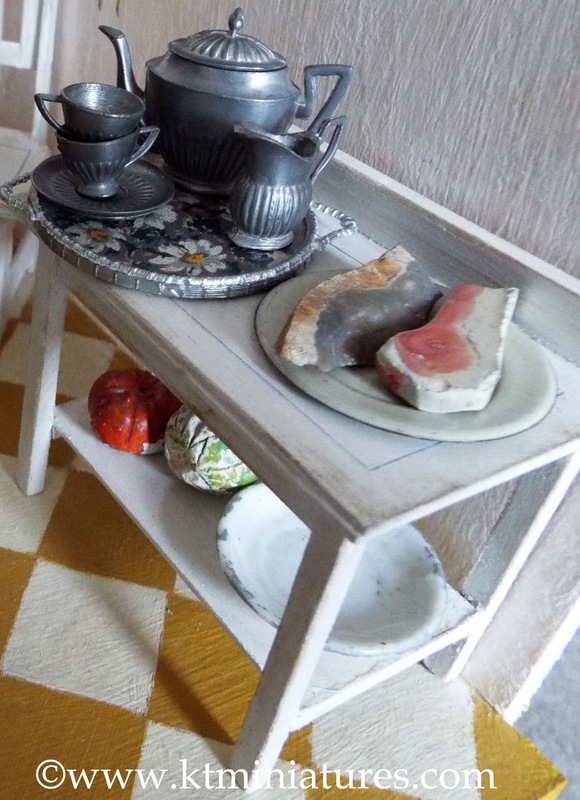 Antique plaster meat next to the tray and plaster vegetables underneath the table, all help to fill the space. On the dresser there is quite an array of antique pieces displayed. A great favourite of mine has to be the exquisite early c1900s German green glass/soft metal jug with two matching wine goblets. 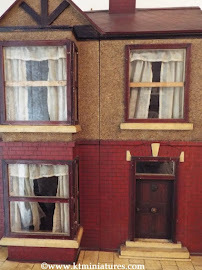 I have had these for a while but they have been sitting loose and a little lost in my studio display cabinet, as I simply had nowhere else to put them. So it is rather pleasing that they now they have a proper home! 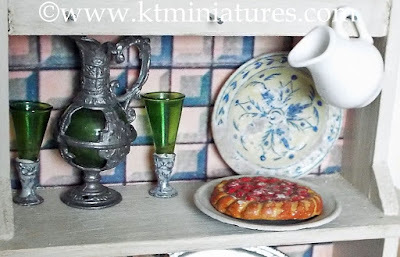 Also displayed on the dresser is a plaster fruit flan, an old white jug and a heavily aged early c1900s decorative wooden plate (ok - it is missing loads of it's paint but I think that adds to the charm). Underneath is an antique cane picnic basket from the 1920s which I have had for quite some time. 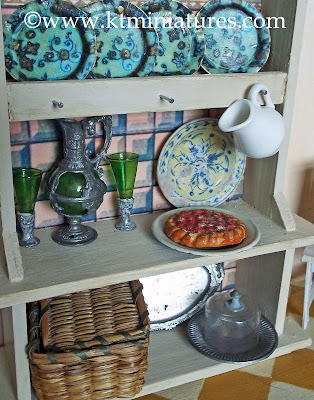 Previously it had perched precariously on top of an old wardrobe in one of my old dolls houses, but now it too has a proper home. The vintage metal oval platter is a mystery and may not be all that old, but I think it looks good as "a filler". In complete contrast, the metal dish with glass food cover standing in front is most definitely an antique, and another favourite of mine. Hanging on the wall just left of the dresser is the white salt box, made out of card and part of the workshop project. 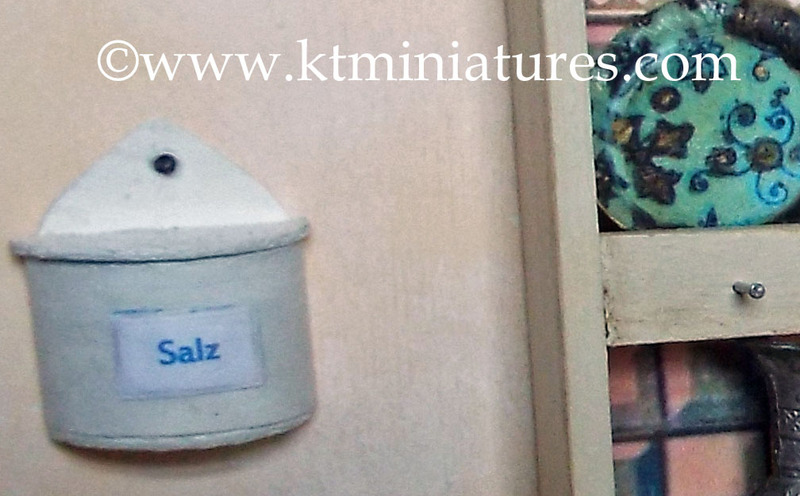 As a quirk I have added a label on the front saying "salz", which is German for "salt". The Delft type frieze running around the walls of the room box, has been reproduced from an old fragment and included as part of the project. 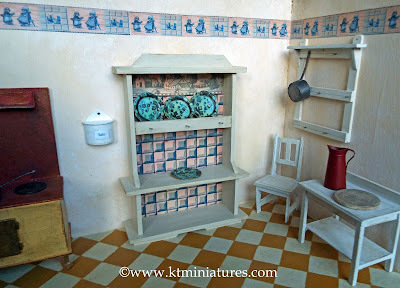 To the left of the kitchen...as you can see the wall shelf has a couple of utensils and imitation bakeware pieces that are part of the workshop kit, but all the other items are old. 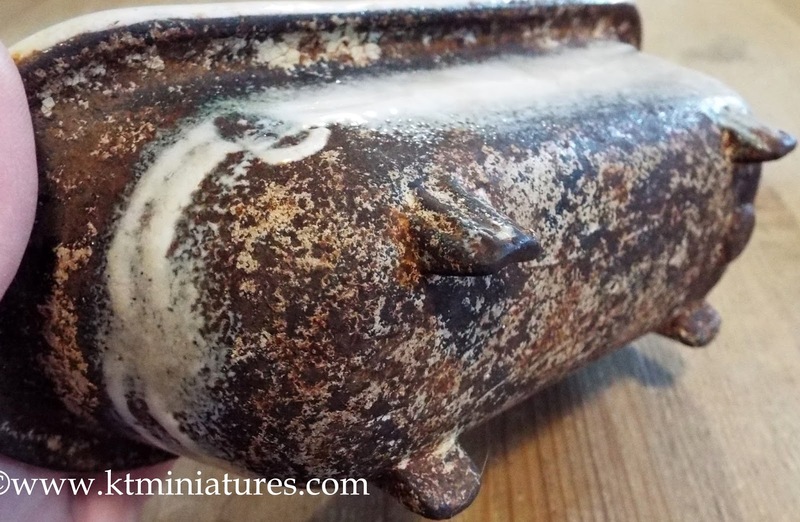 I have had the large German metal teapot seemingly forever - it is quite large in scale and possibly late c1800s, but I don't care that it is big...I think it looks rather nice sitting in its new home on top of the shelf. The antique glass jar with stopper right next to it is possibly late c1800s too and also large in scale. The brown glass on the end of the top shelf is Victorian and another of those items that I wanted to keep but didn't have a home for...but it looks fine there now, even if it is dwarfed somewhat by the tall over sized neighbouring bottle! 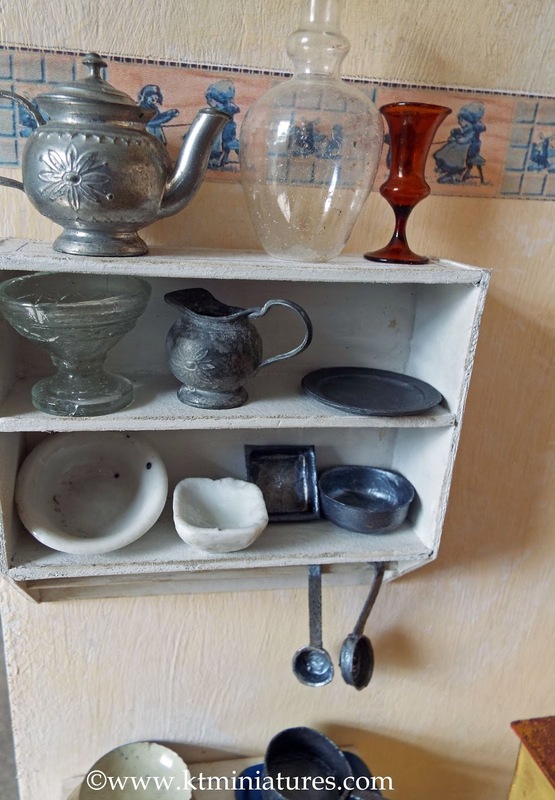 On the lower shelves there is a random assortment of old metal, glass and china pieces crammed together. I need to rummage through my "junk" box and see if I can find even more to cram on there. On the old style kitchen range is a c1920 Britains painted lead cooking pot with lid, and a smallish old hallmarked silver (sugar/salt?) 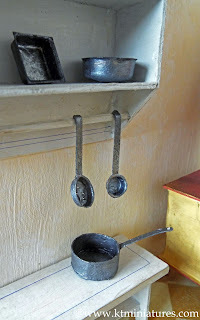 spoon, plus next to it is the top half of a Britains steamer ie it looks like a pan with lid, but there are holes in the bottom. I now need to look for an actual Britains saucepan in matching colour! I am contemplating creating some old looking kitchen canisters to sit on the shelf of the kitchen range, unless I can find some genuine antique ones. 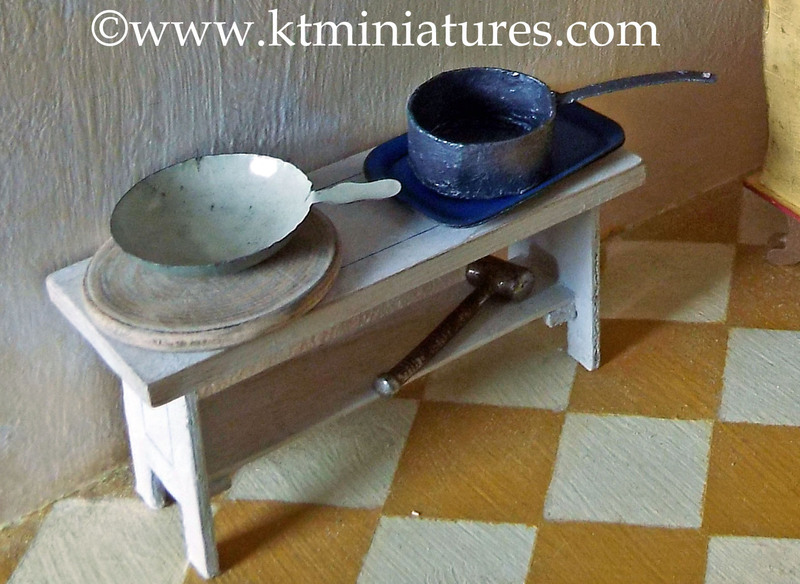 On the old looking bench rack, is the round wooden bread board - both part of the workshop kit, so too the saucepan made out of card. The tin tray, white tin pan and metal meat cleaver are all old. For those of you who are booked to come to either KT Miniatures April 21st or May 19th workshops, then I hope the above photos will help kick start your imagination and help get your creative juices going. For those of you who won't be coming to the workshops, well...I hope you still enjoyed taking a peek. If anyone would like to come to either of the workshops, do get in touch asap. 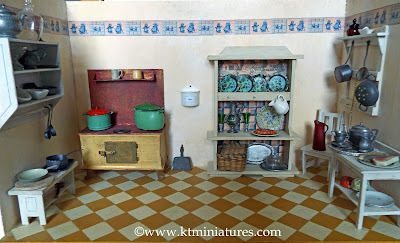 Booking for the April workshop is closing this Friday, as I am now working on the kits. Booking About To Close For April's Workshop! 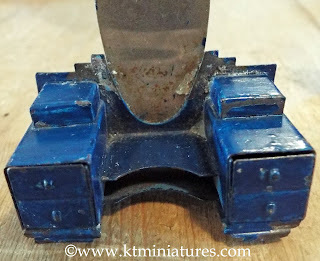 Preparations are now in full swing for next month's workshop. Booking is just about to close for the April session, as the kits are being created. However two people have had to pull out last minute due to real life circumstances, so I now find myself with two spaces. So folks...if you fancy coming to join us on Saturday 21st April at Bicester (Oxfordshire - jct 9 off the M40) please do get in touch with me asap. 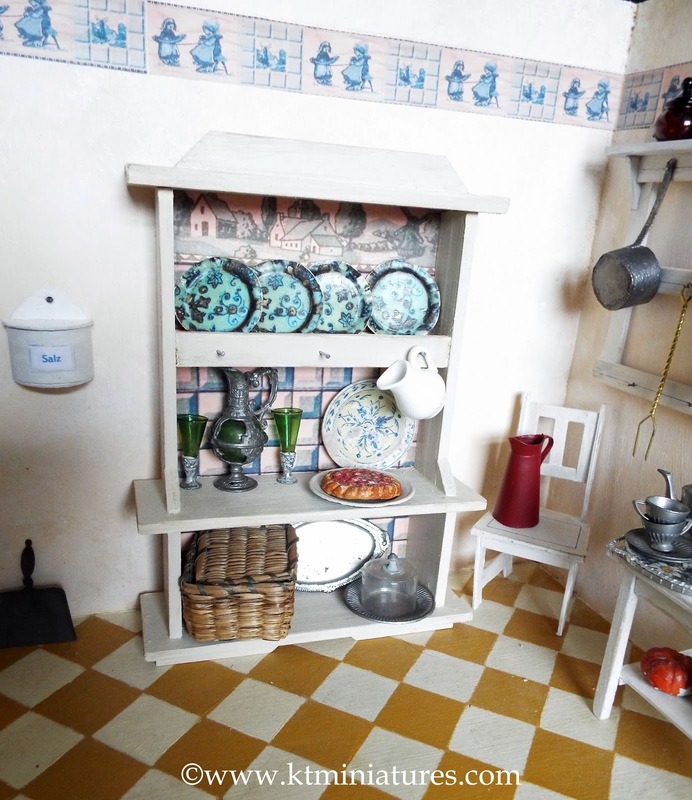 The classes are small, friendly and relaxed - suitable for beginners and experienced miniaturists alike. You will be assured of a very warm welcome! 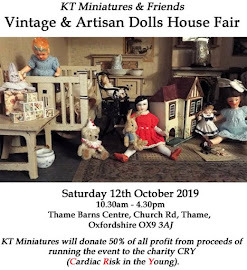 My ex-workshop colleague Robin Britton (who is now retired from the world of miniatures) has promised to come along and join in the fun. The project is versatile, so you can adapt it to suit your own taste and needs. Work at your own pace and choose whatever aspects of the project to focus on whilst you are with us on the day. Then you will have the kit and folder of instructions to finish the project in the comfort of your own home. Also, don't forget...there are two separate kit options. One full kit with room box, and one partial kit with just the furniture and accessories to make (for those of you who don't want the kitchen room box and who have an antique kitchen at home that needs filling)! 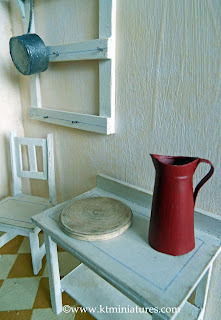 A corner view of just some of the furniture that we will be making on the day. There is a rather splendid chequered painted floor option seen here, for those who want to have a go. 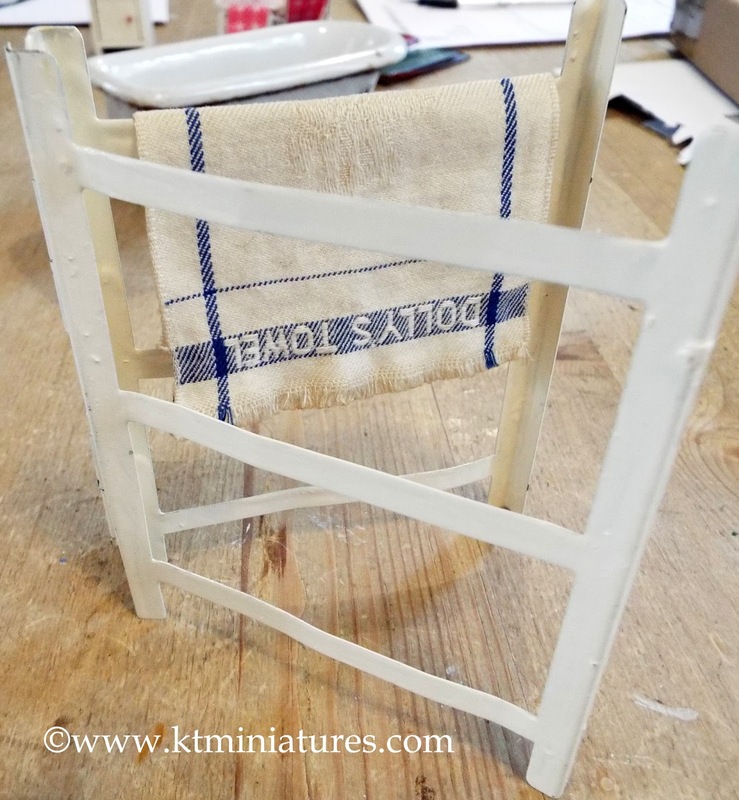 It is a fiddle and time consuming, but well worth the effort! The small kitchen side table, kitchen chair and wooden wall rack, plus saucepan, jug and wooden breadboard are all part of the workshop kit. 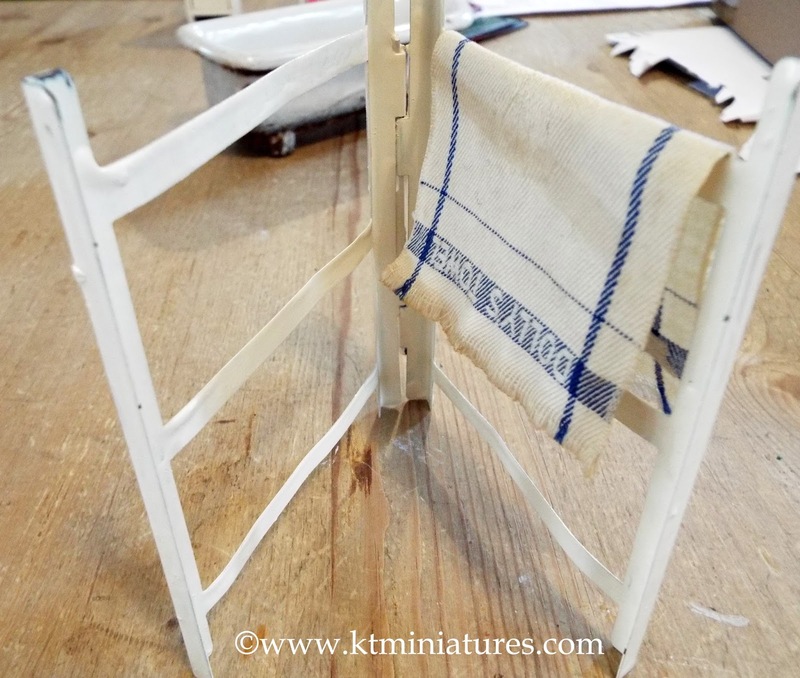 The wall shelf, like most of the other furniture, has been given an aged white finish with a blue ink lined decoration, often used in the old German furniture in the early 1900s. 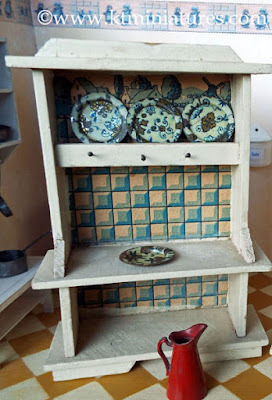 But the furniture can be finished in any colour that is desired. The aged white bench rack is useful for storing pots and pans, and not just for sitting on. 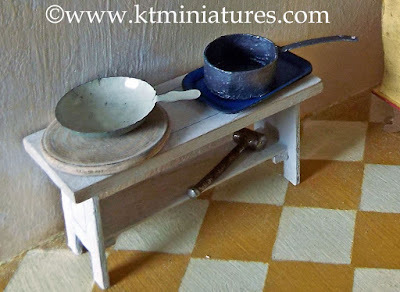 Included in the workshop kit are materials and instructions for making simple utensils, bakeware and saucepans, all made out of alternative materials. 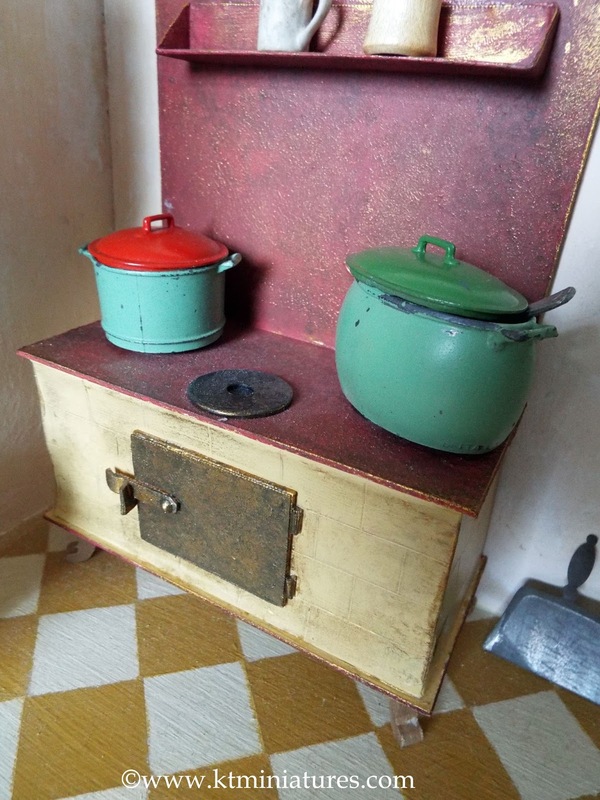 The German style mock tin range can be finished in different colours, with or without a back and even larger or smaller in size. There is a simple salt (salz box) on the wall to make. 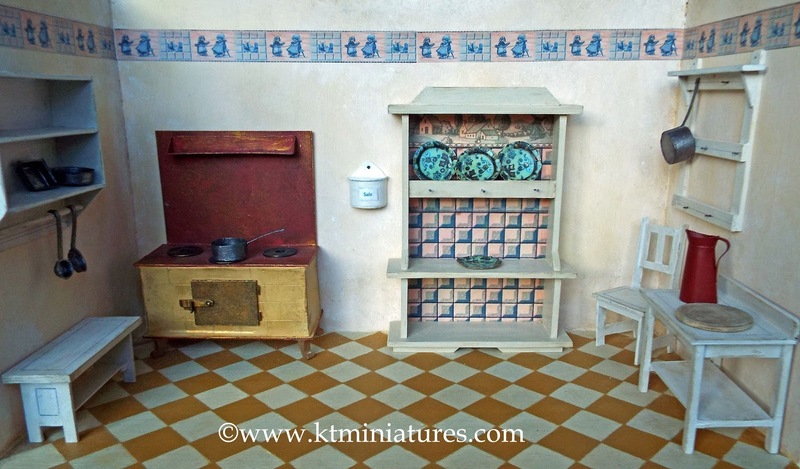 And here is the reproduced antique style dresser, lithographed plates and jug, especially made for this workshop project. The jug and plates are made out of card. It has been great fun creating the prototype for this project. 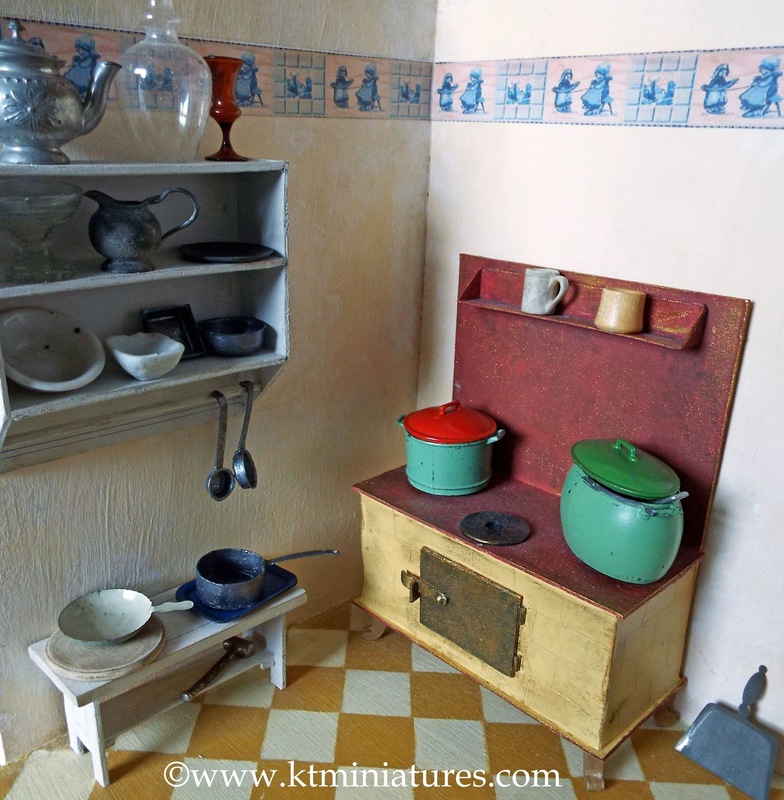 Very shortly I will feature it filled with many of the antique and vintage pieces that I have put aside over a period of time, especially for this little kitchen. And it will illustrate how genuine antique miniature pieces can stand alongside one's own creations to make a rather nice old room setting. If anyone would like to take up the spare space for the April workshop, then please get in touch asap as booking will be closing at the end of this week. Alternatively I will be running this workshop all over again on Saturday 19th May, so if anyone would like to come to that, then also please do get in touch asap. Hope you have enjoyed seeing the photos. 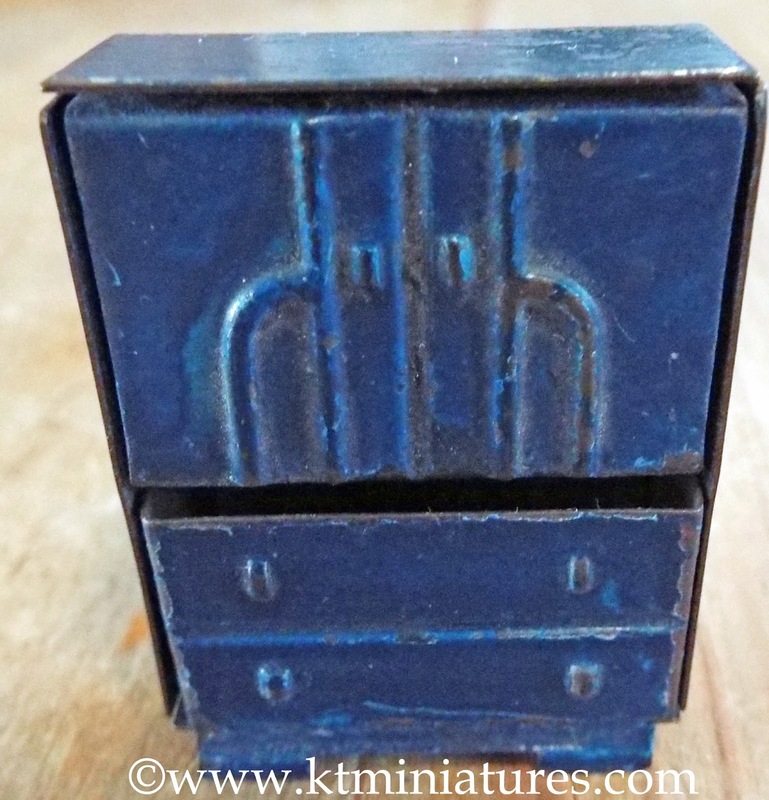 Amongst some of the rather lovely antique treasures put up for sale yesterday afternoon on KT Miniatures website, there are one or two quite unusual pieces, including two little pieces of bedroom furniture that had been proving to be a bit of a conundrum? 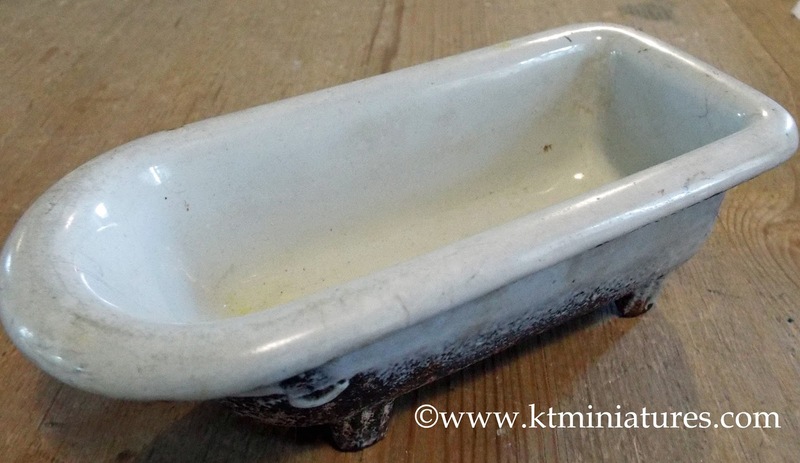 First up, I must show you this magnificent cast iron roll top bath, a real beast of a thing as it is incredibly heavy, believed to be an early 1900s salesman's sample. 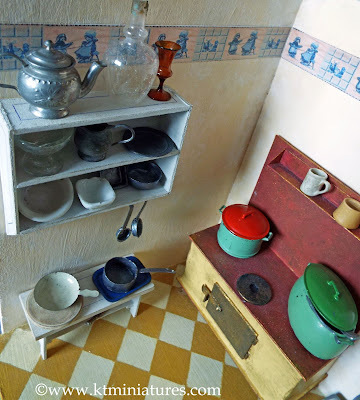 It is far too heavy to have been a toy, a little child would have had difficulty lifting it even with two hands. I have not handled one quite like this before and it is intriguing . It is made from cast iron metal, and the interior is enamelled, just like a real life sized roll top bath. However there is no plug hole and no taps. 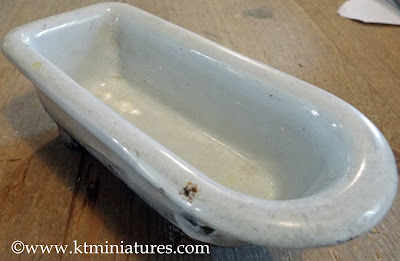 It looks like it has been well used....I bet many a tiny dolly has been bathed in here! The underside has lost much of its coating and is rather rusty as you can see. I can just see a hint of a makers mark underneath but cannot make out what it says. The four feet are ridged. It measures 6" long and would look fantastic in an antique dolls house bathroom. Then there is this unusual old white painted metal clothes horse and accompanying towel. 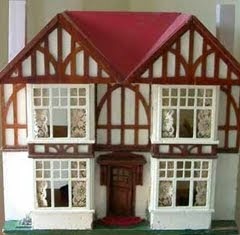 It is quite large in scale, standing at a height of 4 1/2" but was used in a large scale dolls house by previous owner. This came with a bundle of dolls house furniture from the 1920s and 1930s, so have to assume this is of the same era. These following items had been proving to be a bit of a conundrum...but then, the mystery was solved! 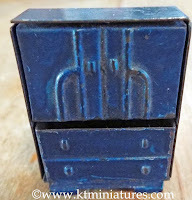 1/24th Scale Tin Art Deco Dressing Table & Bedroom Cupboard - Identity Solved! 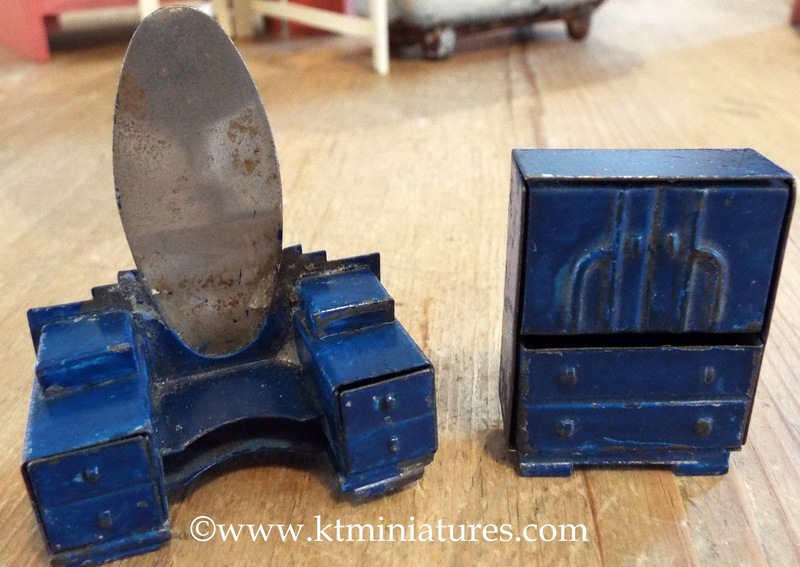 I have to say that when I first set eyes on these two little pieces I assumed that they were from the Dolly Varden dolls house furniture range made by Dinky Toys (Meccano) from 1936 - 1940, as the design and details are almost identical. 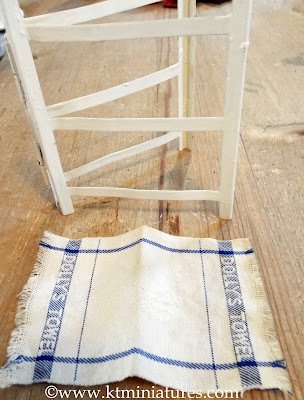 But having handled and sold Dolly Varden furniture over the years, I could see that these had not been made by Dinky Toys. For one thing, there is no makers mark. Secondly the Dolly Varden furniture was made from some sort of metal alloy material that is renowned for suffering from metal fatigue all these years later - these two items were tin. If you take a look at these photos and compare, you can see that they are almost identical in design. Here is the tin version of the dressing table...the drawers are non opening. 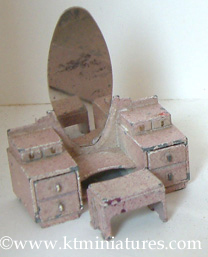 And here is a Dolly Varden dressing table that I sold a few years ago, the drawers opened. 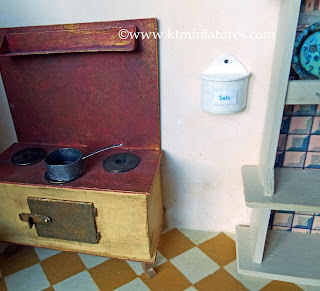 Here is the tin version of the bedroom cupboard. 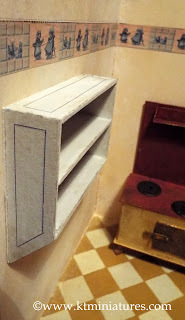 Although there is an illusion of two lower drawers, it opens as one. The doors above are mock and non opening. And here is the Dolly Varden bedroom cupboard that I sold a few years ago. The lower drawers opened in the same way as the tin version ie. illusion of two drawers but opens as one. So there we are....as you can see they are almost identical in design. 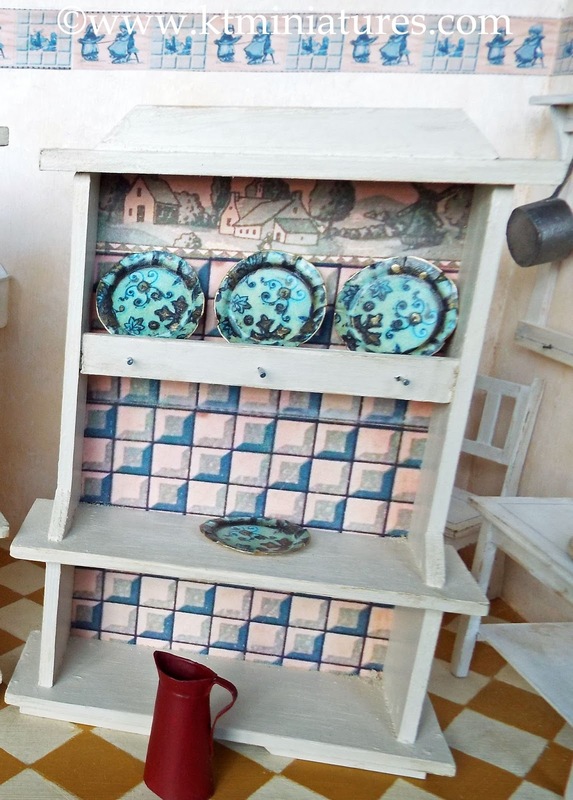 But then, after a little bit of Googling I found some other identical tin furniture being sold with a bundle of Dinky Dolly Varden dolls house furniture, on an auction house website quite some time ago. 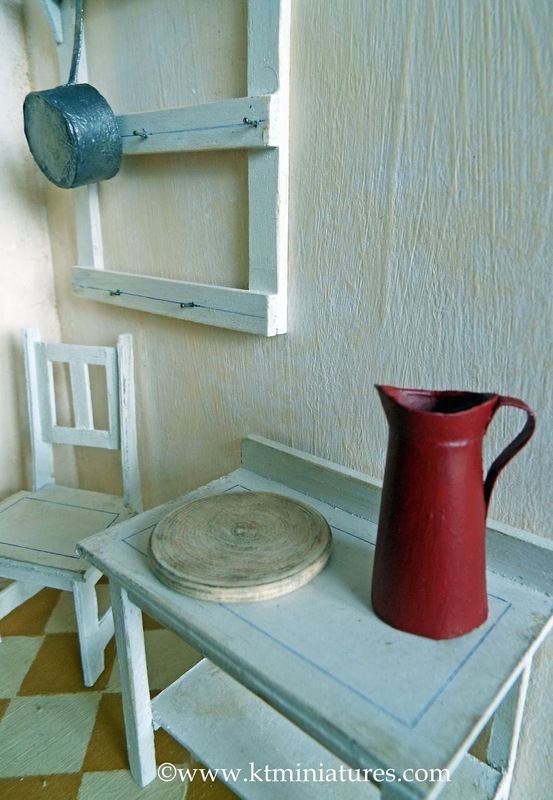 Now the auction house described the tin bedroom furniture as being made by Holdfast. With that in mind, I dug out my ancient and out of print Marion Osbornes book of A-Z 1914 to 1941 Dollshouses and looked up Cartwright, as I do know that they marketed dolls house furniture sets under the names of Holdfast and Gwenda. And there, tucked away on page 49, which I had not absorbed up until now (duh...), is information about a "Gwenda Bedroom Set" from the Toy Trader of 1938. .
Marion has added a note...."The Gwenda bedroom set in the Toy Trader advert is very similar to the Dolly Varden furniture by Dinky. 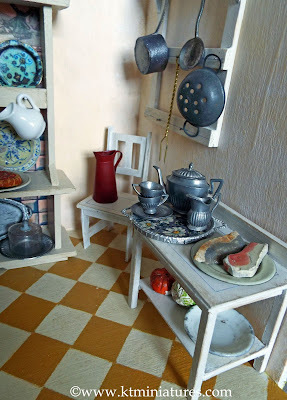 The Gwenda set is from pressed tin, whereas the Dinky items are cast metal". 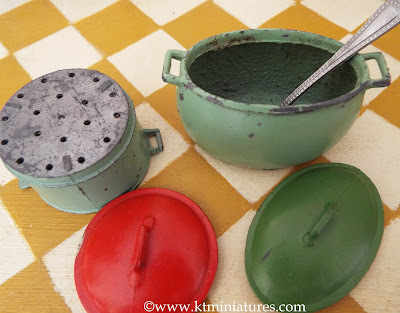 According to the information in Marion's book, it looks like these little tin items came out in March 1937. 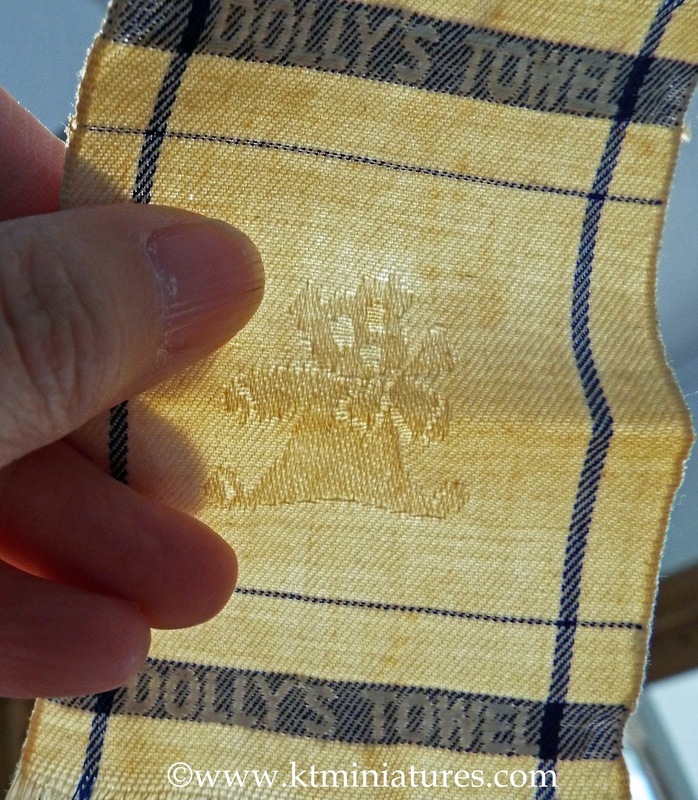 So that means that would be about a year after the Dolly Varden items had already been in production. 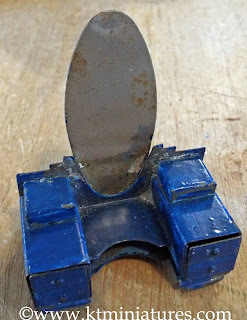 I wonder what Dinky Toys thought about it all? 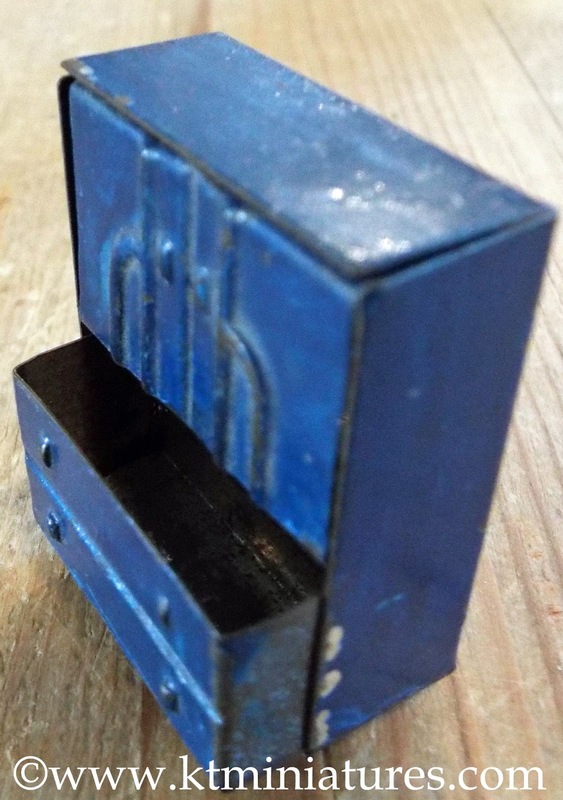 These unusual little tin items that come in a blue painted finish, are currently for sale on the following link and are suitable for a 1/24th scale dolls house.